John gave me Mastering the Art of French Cooking for Christmas. I was inspired, as was half of the population, by Julie and Julia to give it a try. At first, I thought the book was a bit intimidating, but I think it's just because there are illustrations instead of photos. It makes it seem very scientific. Once you get going, it's actually really excellent because she tells you everything, so you can't go wrong. 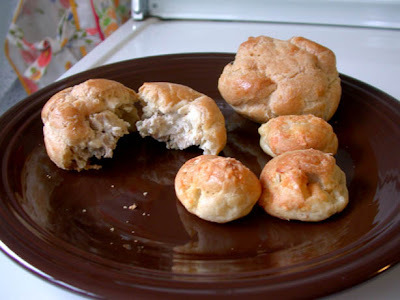 I made the puff shells (pate choux) stuffed with cream of quail as well as these cheese puffs (pate fromage). I love popovers, and these are similar and very satisfying. I made them back in January, and am only getting around to posting it now, so I whatever profound thoughts I had, I've forgotten. How's this: these were really cool, but make sure someone is watching the kids while you're cooking! I am eager to try them again filled with ice cream - perhaps that will be a fun summer treat!